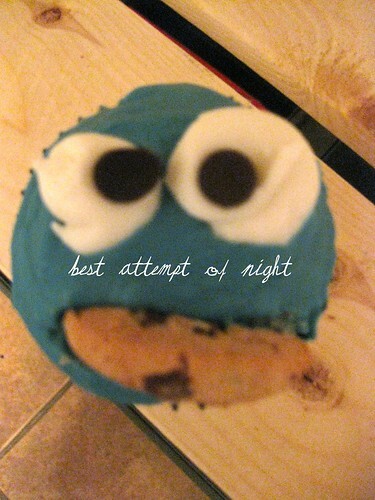 it should be noted that i spent all night (yes, all night) attempting to make cookie monster cupcakes. as an i'll-see-you-in-three-months gift for little zoobie (my nineteen-month-old friend that i look after a few afternoons each week). she loves cuppycakes which shall here-to-for be called "happy-ahs" (derived from happy birthday, of course) and on top of that she is nuts for all the sesame street characters. most especially: elmo, abby, big bird (bia), and cookie (which she pronounces by simply grunting). so yes, this one little happy-ah took me all night. hopefully, i'll get a few more turned out. but the others are downright terrifying. can you blame me? remember, i'm not particularly adept with frosting. note: if you're confused as to why i won't see zoobie for three months it's because i'm off for some fresh-air in utah! That is the best thing I have EVER SEEN IN MY LIFE. One might think I'm exaggerating, but I'm pretty sure I'm not. Cookie Monster holds a special place in my heart. Last fall, my roommates and I made four exquisite cupcakes with the faces of four of our close guy friends on them and it was so fun trying to make sure they all were recognizable. That is ONE CUTE CUPCAKE! Also--Utah for three months? Sounds kind of amazing! I'm super impressed lady! I'm sure she will love it! if you ever get the chance, could you make a list of your recommended reads? This is sooooo cute! I wish all nannies were as much fun! so cute! I want to try that! You did an INCREDIBLE job! Looks just like him! She'll love it! and being one that is also fairly challenged in the frosting department---i take my hat off to you! this little number looks fab! It is perfect! You are such a sweet girl. dear anonymous, it makes perfect sense and is unbelievably flattering--thank you, so much. and right now i'm reading (for the second time) dancing on thorns. it's about ballet dancers and i love the little world created in it and while its not winning any pulitizers, i really like it. that story is beyond precious! and your cupcake looks great. i just finished kavalier and clay for the second time, its one of my favorite books of all time. thank you so much for replying with your recommendations! i am very happy i came across your blog (a la naomi). i read your words. then read them again, twice, thrice - they resonated with me and made me rethink how i feel about my own ned. it was weird.. i felt such a kinship with your writing - uncomfortable, painful, and yet - incredibly raw and important. so thank YOU. You are so good. What a cute cupcake!